When I found myself in the long line at the Post Office at 4:30pm on December 22nd, I decided it was time to take a break from my Etsy shop for the holidays. Whether you’ve had slow sales or been slammed, it’s likely time to give yourself a break and enjoy some festivities with the family. Mailing deadlines have passed – the hot cocoa and fireplace are calling. 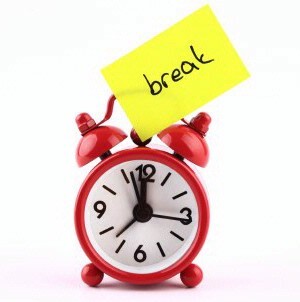 Go ahead, take a break! Make it clear in your shop’s announcement and policies page that you’ll be on vacation and not taking orders, responding to convos, etc. Make sure to tell people the date you’ll be back, so customers aren’t left hanging! Just one little peek at your stats won’t hurt, right? It’s not a vacation if you’re still obsessively checking Etsy. If you might be tempted to just take a quick peek at your shop stats or activity feed, shut the computer down. Is the worst case scenario already running through your head? What if I miss out on a huge custom order? Dispel the belief that something terrible will happen if you take a break, it is an irrational fear. When those types of thoughts enter your head, kick them straight to the curb. You will be back to work in no time, so savor the moments that you have on your break – whether it be with family, friends, or time alone. It’s not relaxing to be thinking of all the things you could be doing in your shop – so don’t.